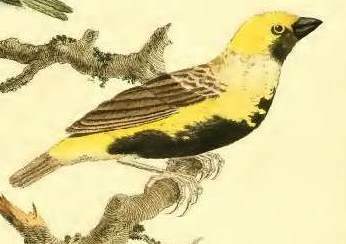 The Yellow-crowned Bishop was formally named by Johann Friedrich Gmelin, a German naturalist. Gmelin described many new bird species in a book in 1789 in the style of Linnaeus' publications, giving a brief description in Latin and a synonomy, including a reference to Peter Brown, an English naturalist and illustrator. 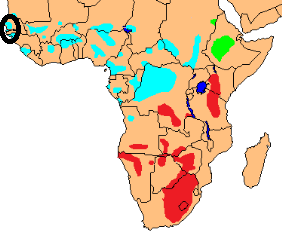 Gmelin noted the locality for the Yellow-crowned Bishop as Africa. Peter Brown was the first to write about, and illustrate, the Yellow-crowned Bishop. He called it the Black-bellied Grosbeak and gave a description of the bird. Brown notes that his specimen was in the collection of Thomas Pennant,an English ornithologist. Pennant travelled in Europe but not in Africa, so he would have obtained it from someone else. The bishop would have been brought by ship from Africa to England, where it would have been purchased by Pennant [note: in the species text, Brown misspelled Pennant as Tennant, but acknowledged Thomas Pennant in the Preface]. The type locality was later restricted to Senegal, based on Vieillot 1805 who listed specimens from Senegal and Ethiopia. 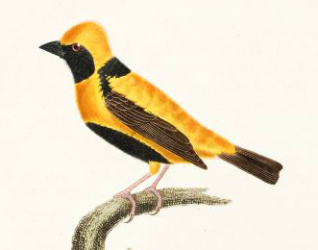 The Ethiopian specimens are based on a different subspecies of the Yellow-crowned Bishop, and thus cannot be a type locality. Buffon 1778 had noted that James Bruce, a Scottish traveller, mentioned and painted the Yellow-crowned Bishop in Ethiopia. Loxia afra	Gmelin 1789 Syst. Nat., 1(2), p.857	Africa (Senegal; Grant & Praed, 1944, BBOC, 65, p.10). afer (Latin): African, from Africa. Golden Bishop, Napoleon Bishop, Taha Bishop. Type specimen not located; the illustration of Brown 1776 serves as a type.